This hack for the iPhone makes it snow behind your icons and above your wallpaper. 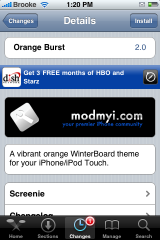 It is downloaded in Cydia and activated by Winterboard. You must be jailbroken for this to work. It does slow down the device a bit and I did notice minor glitching when swiping between pages. My iPhone has a lot of hacks so that may be something to do with it. If you try it out, let me know how it works for you. There were a few pretty cool mods released in Cydia recently so I thought I would talk about a few of them. Each of the following mods use WinterBoard to enable/disable them. 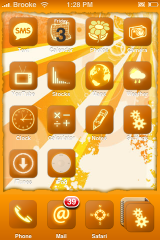 The first two I would like to mention are themes; Orange Burst and ubuntu. Neither theme seems to have a ton of icons but, if you are looking to just give your main SpringBoard page a new look, these might be for you.